The castle is a Medieval building and has a stone spiral stairs to the top. There are 101 steps in all to the top. Access to the tower is through a passageway within the base of the wall.The Castle is Nenagh’s oldest building, and it’s construction in the 13th Century laid the foundation for the development of the town. Theobald FitzWalter, whose successors would become Earls and Dukes of Ormond, built the castle and upon its completion c.1220 it served as the main seat of the Butler family, until 1391. 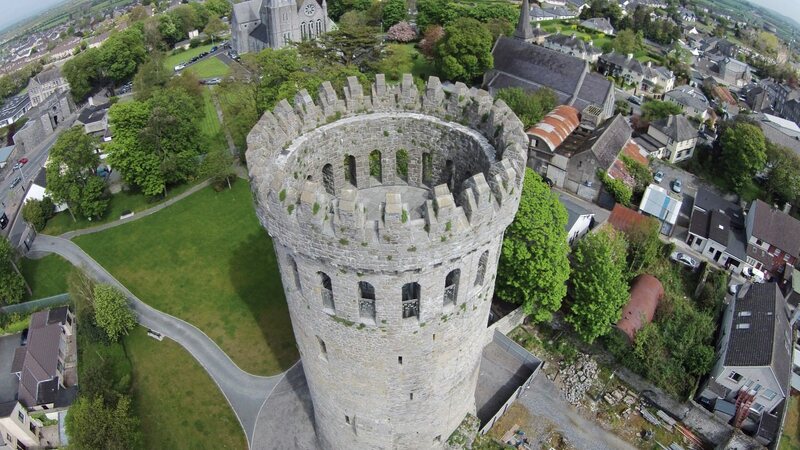 The Castle boasts the finest cylindrical keep in Ireland. Like most keeps, it formed part of perimeter of the fortress, being incorporated in the curtain walls surrounding a five-sided courtyard. The keep features four storeys and thanks to a recent renovation, this wonderful landmark now represents the towns premier tourist attraction. The castle is a medieval building and has a stone spiral stairs to the top. There are 101 steps in all to the top. Access to the tower is through a passageway within the base of the wall. This has low head room and visitors will need to stoop to avoid hitting the stone above.